Seeing a rainbow around 11 o’clock at night is an amazing experience. Watching a spectacular sunset around midnight is pretty great, too. But seeing it all happen a second time, almost exactly one year later, in the same place? That’s Alaska. I can’t guarantee that you’ll have the same experience that I had. 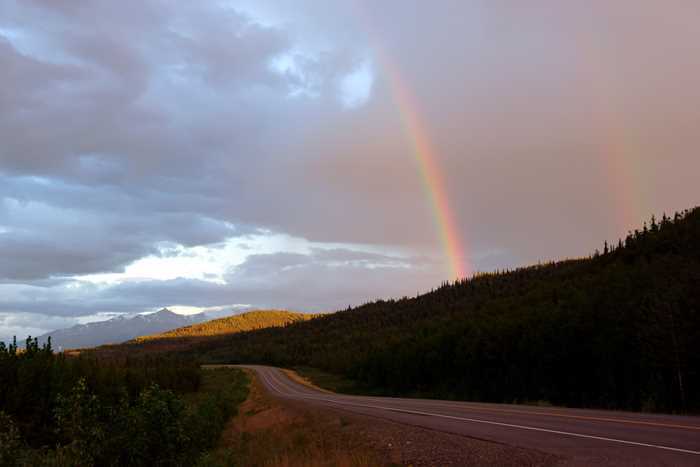 But I would suggest, if you’re staying at Denali National Park for a few nights in late spring, it’s not a bad idea to take a drive up the Parks Highway and see what happens. 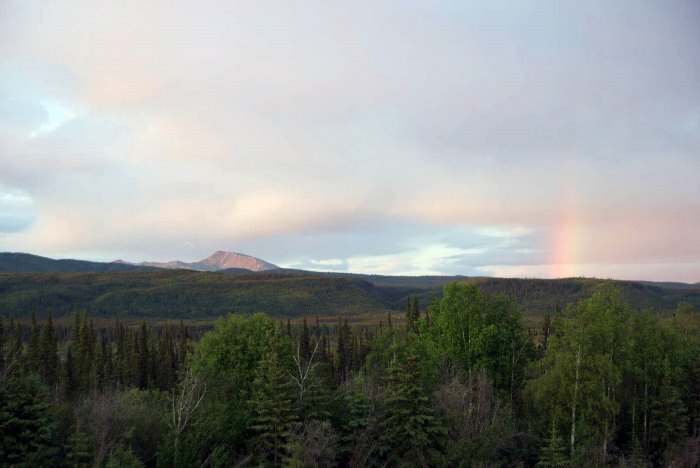 The Parks Highway (Alaska Route 3) connects the Anchorage area with the Denali park entrance and Fairbanks. On this night, I explored the area between Healy and the Nenana River. After settling into my motel room in Healy, I realized that an extraordinary sunset was taking shape. 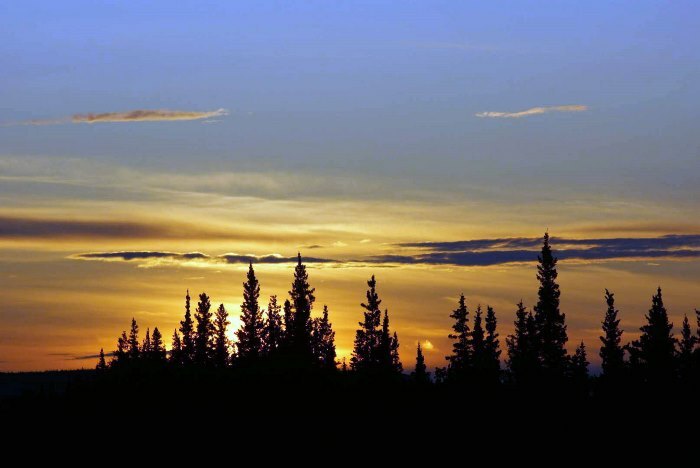 I left my motel room around 11 p.m. and started driving north — towards the sunset, because that’s where the sun sets in Alaska in late spring. 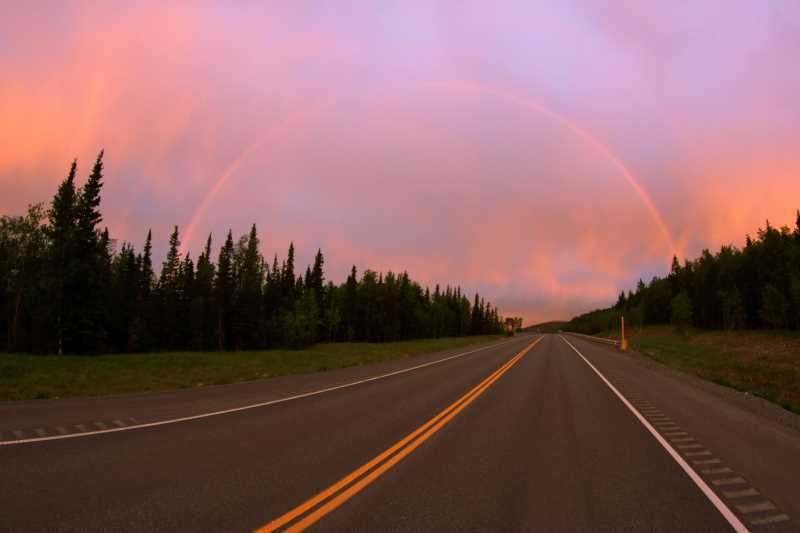 For the next hour I watched as intense rainbows arched over the road, and the sky blazed with color, as if it was on fire. 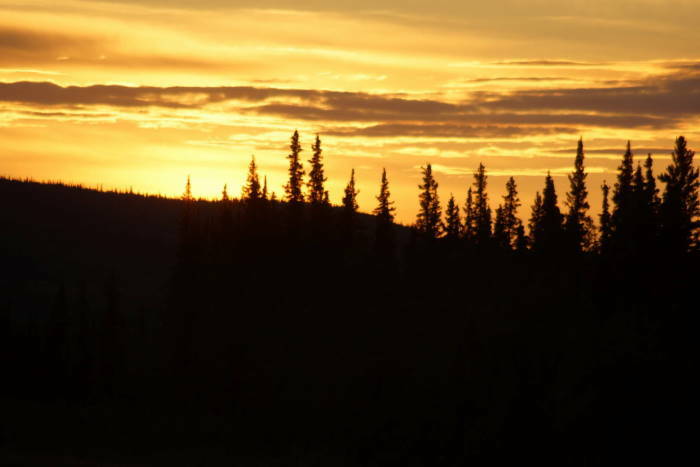 You can see it all on my compilation page of amazing midnight sunsets in Alaska from the 2015 trip. A year later (almost to the day! ), and I was in the same situation once again. Clouds were hanging over Denali, but the shelf abruptly ended to the north. There were showers along the edge, and then sunshine. It was all happening again! 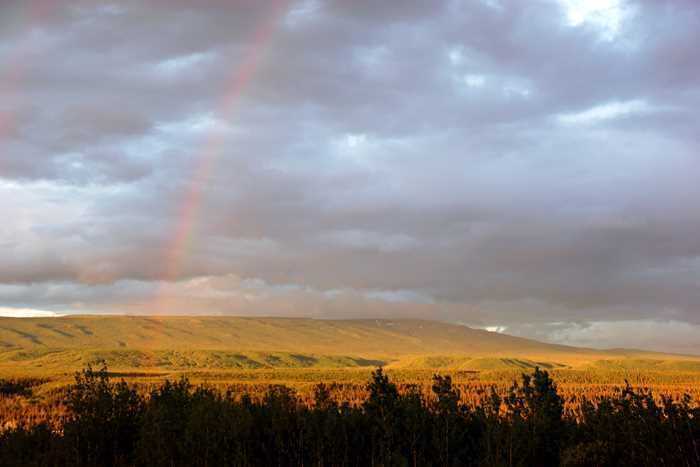 … and even a hint of a double rainbow. But, it never quite formed a complete arch, the same way it did a year earlier. The Parks Highway heads north from Healy for miles, with almost no side-roads and only a few turnouts. I was limited to what I could see from the road itself, which is somewhat frustrating. I kept hoping to find a side-road that would provide a little extra elevation, giving me a better view. … and some brilliant yellows and oranges, but the sunset just didn’t quite live up to the previous year’s awesome show. But, would I chase the sunset again, if I end up here again next year? Of course I would! It’s worth noting, on my second night in Healy, there was no sun, and no sunset. Clouds ruled the sky, and I didn’t even try to to find a nice shot. So, it doesn’t happen every day. If I do find myself in the same situation again next year, I might try driving south, instead of north, down to the Denali Highway. The final few miles on the western end of that road are very beautiful, and might look great at sunset. I’ll let you know what happens. 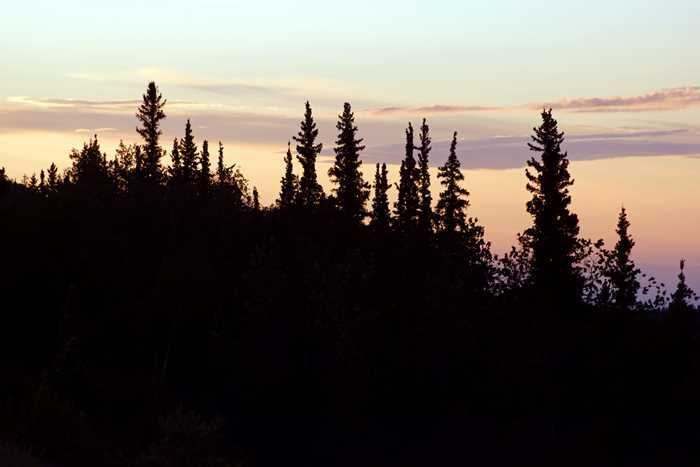 The Parks Highway, north of Denali National Park, is a great place to watch a midnight sunset, if conditions are right. Don’t be afraid to drive around a bit — the sun sets very slowly at this time of year. You might see something spectacular!